If you wish your kids were walking to school, but logistical problems are getting in the way, you need a walking school bus. It offers families the same help as a carpool does, plus all the benefits of commuting on foot. 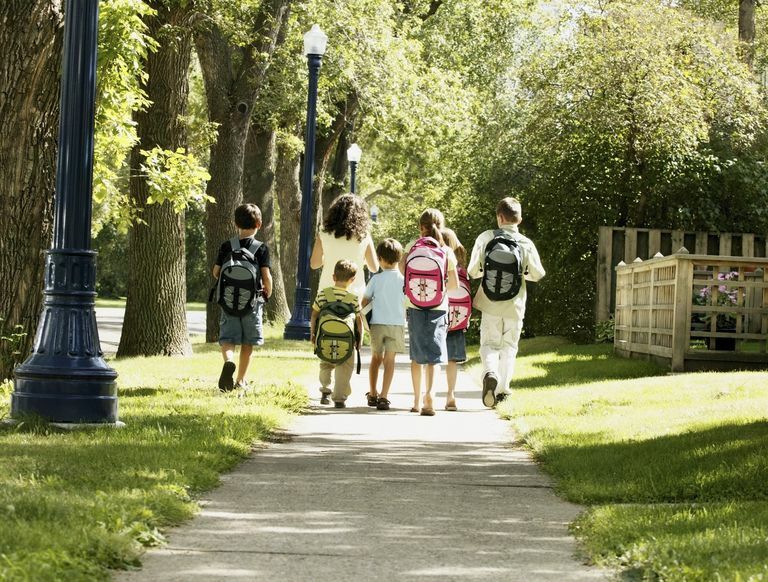 In a WSB, a group of children walks to school together (daily, or a few times a week), with one or two parents taking turns supervising each walk. This way, kids are physically active before school while enjoying the camaraderie and improved safety of traveling in a group. Plus, parents get exercise too. They save money on fuel and wear on their vehicles. And they reduce carbon emissions. A walking school bus can be formal, with codified schedules and rules, or a casual arrangement among two or three families. To get yours going, spread the word to neighbors and other families at your kids' school. If your school has a Facebook group or e-newsletter, use those to help you gauge interest (and proximity). You really only need one or two other families to get started. Start by planning a route. Of course, you need to get from point A (kids' homes) to point B (school). Determine whether you'll pick up each child at her home, or gather at designated meeting points along the way. Next, make a timetable. Figure out when you will need to meet in order to pick everyone up and get to school on time. Remember that little kids can't walk as fast as bigger ones. Decide whether the walking school bus will walk every day, or on certain days of the week. Will you have enough kids and chaperons to walk after school, too? How will you handle early dismissal days, illnesses, or other changes? Once you know where and when you're going, schedule the adult walkers. Make sure everyone knows which day he or she is responsible for, and who to contact if an emergency comes up. It's a good idea to distribute the home and mobile phone numbers for each family to the group. What if kids are whiny and foot-dragging? Play walking games if they whine or bicker during your walks. Or talk to the other parents about a reward system, such as a sticker chart, for good behavior. You should have at least one adult per six children on your walking school bus (for kids ages six to 10; older kids may require less supervision, and younger ones more). Before the first day, take a test walk to check the route: Are there sidewalks? Stop signs or lights? Crossing guards? (You might have to call the school district to determine this, if you're testing the route on a non-school day.) How busy are the streets? If you encounter any problems, consider looking for an alternate route or meeting place. Or contact school or law enforcement representatives to request changes. "Safe Routes to School" is an excellent resource, too. The organization can help you advocate for traffic and infrastructure changes that make your city safer for pedestrians. Before the first walking school bus trip, remind kids about basic walking safety rules, such as looking both ways before crossing the street, crossing with the light, holding an adult's hand if requested, and so on. Revisit the rules periodically throughout the school year. What If You Want to Bike? Totally doable! The bicycle equivalent of the walking school bus is called a "bike train," and you would organize it in the same way. Make sure that all participants (including adults) have helmets that fit. This should be non-negotiable. If anyone has trouble affording a helmet or bike, check with your school district or police department to find out about free or discounted bike and helmet programs.